Directions Take with a glass of water. Adults and children 12 years and over: 1 to 3 liquid gels daily. This dose may be taken as a single daily dose or in divided doses. Children 2 to under 12 years of age: 1 liquid gel daily. Children under 2 years of age: Ask a doctor. Store at 15-30 degrees C (59-86 degrees F). Protect from excessive moisture. 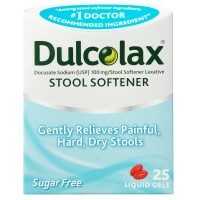 Uses For temporary relief of occasional constipation and irregularity. 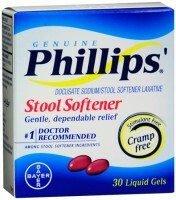 This product generally produces bowel movement in 12 to 72 hours. Dulcolax Stool Softener contains the #1 doctor recommended stool softening ingredient. Many people find two liquid gels an effective starting dosage and then one liquid gel for maintenance. Dulcolax Stool Softener should not be used for bowel cleansing procedures. Warnings Ask a doctor before use if you have: stomach pain, nausea or vomiting; a sudden change in bowel habits that lasts more than 2 weeks. Ask a doctor or pharmacist before use if you are presently taking mineral oil. 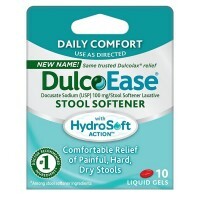 Stop use and ask a doctor if: you have rectal bleeding or no bowel movement after using this product. 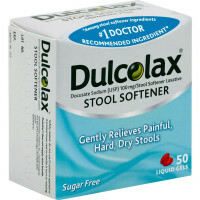 These could be signs of a serious condition; you need to use a laxative for more than 1 week. If pregnant or breast-feeding, ask a health professional before use. Keep out of reach of children. In case of overdose, get medical help or contact a Poison Control Center right away.